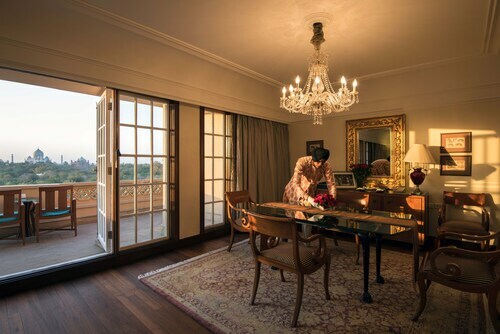 Expedia can help you save with an Agra District travel package. With all that extra money in the bank, you might even like to book a few additional nights. 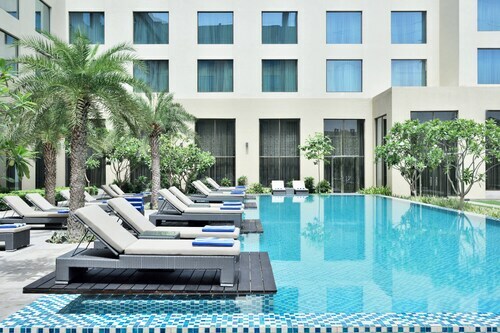 Reserve a travel package on Expedia and save as much as 21.4%*. Search through our intercontinental database of more than 400 airline partners and 321,000 worldwide properties. Too many on there to select from? Don't stress — we'll help you decide! It's nice to just wander the streets in a new place, but sometimes it's wise to make a plan. Grab your travel programme — we have loads of excellent ideas for your forthcoming Agra District holiday. Agra Fort guarded its grounds from attackers for countless years. Visit this time-worn battlement and discover the secrets hidden behind its walls. There's a fabulous range of things to do in this destination. Quietly observe prayer time, connect with community members and appreciate the distinctive architecture of Jama Masjid. If you're eager to know more, why not ask some questions about local religious customs? Still got some time to spare? A quick way to experience an authentic taste of a destination's culture is to take in its busy marketplaces. Peruse the wares and shop like a local at Sadar Bazar. Life is either a bold adventure or nothing at all, so why not open yourself up to some new and interesting experiences? If you'd rather check out the full range of activities, head to the Agra District things to do page. After a long day of wandering in Agra District, lay your head in one of 88 properties. The best cheap holidays and luxury getaways are only the beginning at Expedia. 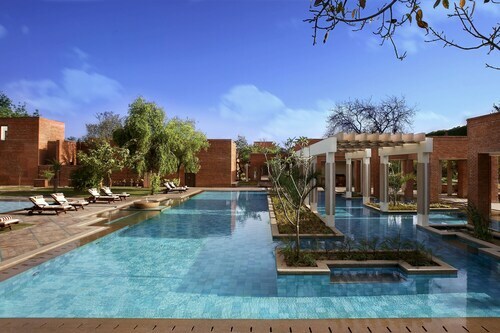 The Oberoi Amarvilas, Agra (Taj East Gate Road) and the Four Points By Sheraton Agra (C-1, C-2, Taj Nagari Phase 1) are two of the higher-end choices in Agra District. Book a room at either and you're bound to have some of the nicest services and hotel features in town. If you'd prefer to spend your cash on things like hair-raising adventures and rowdy nights out, why not look into some of our budget options? The Hotel Shree Residency (Adj. to Shree Talkies, Bye Pass Road) and the Amar Yatri Niwas (Fatehabad Road) are a couple of recommended ones. Kheria Airport (AGR) is located 3 miles (5 km) southwest of the main streets of Agra District. Pick up your bags, wave down a taxi and get this adventure started! The white mausoleum for Shah Jahan’s third wife is a timeless, ingenious work of art. Decorative carvings, stone inlays and mosaics inspire awe of Mughal culture. An impressive defensive structure built for Mughal emperors is a vast citadel encompassing marble towers, palaces, mosques and gardens. The Friday Mosque is a grand 17th-century Mughal masterpiece encompassed by the infectious atmosphere of Agra’s time-honored and bustling bazaars. Admire the richly ornamented gateways, opulent shrine and manicured gardens of the final resting place of Mughal emperor Akbar the Great. Stroll through this haven from the heat with manicured lawns, raised sandstone platforms and tree-lined avenues. Revel in the quiet and serene atmosphere of this little-visited riverside tomb, which was built for Persian poet Afzal Khan. With intricate detailing, expansive gardens and a somber burial chamber, this splendid tomb is an apt tribute to one of the Mughal Empire’s greatest rulers. Visit this artistic monument, which opens its doors to followers of all spiritual beliefs and movements. It is unfinished now and may remain so forever. Nicknamed the Baby Taj, this exquisite tomb is made of pure white marble and is known for its intricate and elaborate carvings.